Somebody got into the strawberries in the garden. Bad dog!! Personally, I think he is a good boy for eating healthy. There are worse things, a lot worse he could eat. Dad is bad, expecting poor Cooper to ignore the strawberries. C’mon, man! 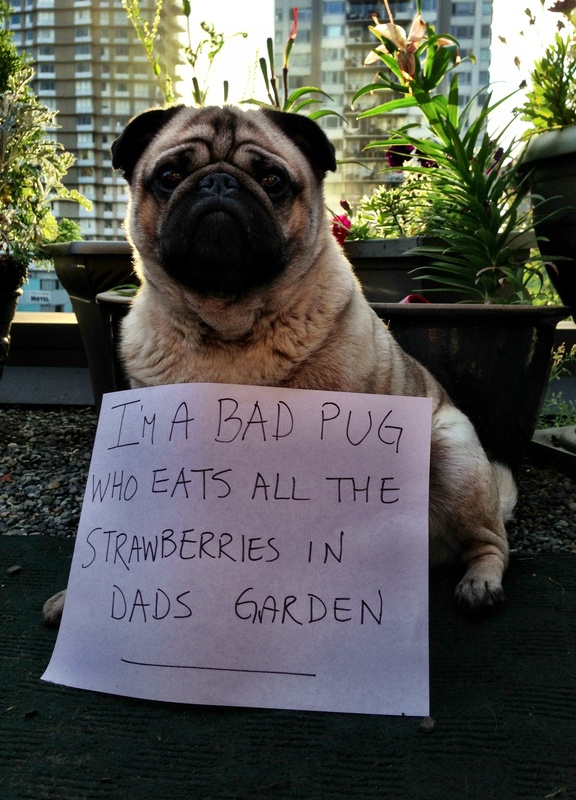 My pug has never expressed an interest for strawberries. She does however think Cheese and bacon are the 2 best foods in the planet! One of my pugs did the same with my cherry tomatoes! This sounds like a suspiciously LOW garden, for a pug to raid it! Pugs can look so ashamed, but we know it’s a ruse. They are never really sorry. Maggie eats all the tomatoes in our garden.